It was a clean sweep for Germany in the women’s competition at the Leipzig Messe, with Alina Ross finishing second and Kristina Boe coming in third. In the men’s category, German vaulter Thomas Brüsewitz took the silver medal, with Juan Martin Clavijo of Columbia winning the bronze. Only one Pas de Deux team competed at Leipzig. Theresa-Sophie Bresch and Torben Jacobs, defending FEI World Cup™ champions and second in the standings with a win at Salzburg, put up a high score that would have been a serious challenge had other vaulting teams been present and earned more qualifying points on the road to the FEI Vaulting World Cup™ Finals in Saumur, France, in April. After the first day of Vaulting excitement and a series of close scores, the audience in the Leipzig Messe on Saturday were on the edge of their seats. The ladies were up first and after accomplished performances by Sheena Bendixen of Denmark and Marina Mohar of Switzerland, who finished fifth and fourth, respectively, the battle was on for the podium positions. Ross turned in a confident, smooth programme in her first World Cup qualifier, highlighting her flexibility and clean transitions with a score of 7.762 and 7.779 overall for the two days. FEI Vaulting World Cup™ and FEI World Equestrian Games™ champion Kristina Boe entered the arena next. Her fast-moving Star Wars-themed routine featured a tricky dismount, which she nailed. But a loss of balance midway through the performance and a lower horse score gave her some trouble, and with a 7.594 score - and 7.746 overall - it was not enough to overtake Ross. The final performance by Janika Derks to romantic music had a few inconsistent transitions. However, her seamless artistry showed through, as well as her harmony with the horse, Dark Beluga, and with an 8.814 score, and 8.622 in total, she took the win. On the men’s side American Kristian Roberts and German Viktor Brüsewitz showed great skill, especially Roberts’ enormous dismount and Brüsewitz’s storytelling in a Godfather-themed performance, for fifth and fourth places, respectively. Juan Martin Clavijo, only 18 years old, has been an up-and-comer in the vaulting world and once again showed why he was a threat to the more seasoned athletes. He gave a subtle, extremely fluid performance that put a spotlight on his dance-like flexibility and clean finishes for a score of 8.416 and 8.275 overall. Thomas Brüsewitz, brother of Viktor, had a brief mistake where he lost his position aboard Danny Boy Old and stepped off the horse. But with an otherwise smooth programme that showed off effortless transitions and daring drops, the four judges were won over, awarding him a score of 8.556, for 8.979 in total. Only Jannik Heiland, a multiple medal-winner in the discipline, was left to pose a challenge. He demonstrated incredible strength and artistry on Dark Beluga in a routine based on the film, The Pianist, and with a super high back somersault dismount, snagged the top spot with a score of 8.979 and 8.814 for the weekend. Bresch and Jacobs’ programme rounded out the evening with a dramatic and energetic routine that was a textbook example of teamwork, versus vaulting side by side in the Pas de Deux. 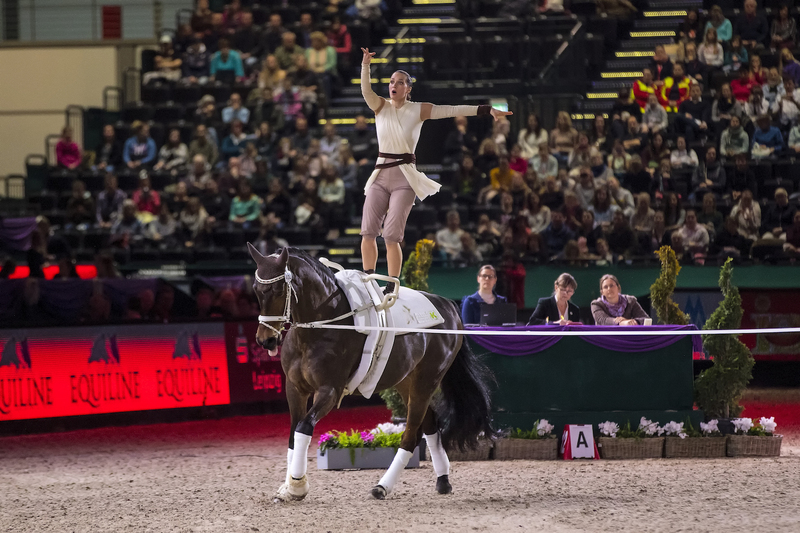 Performing as smoothly as individual vaulters, whilst demonstrating complicated lifts and intertwined stances aboard Danny Boy Old, they deserved every point of their 8.876 score, which brought them 8.442 points overall for the two days of competition. With only one qualifying leg remaining, the Vaulting action is sure to heat up even more. The FEI Vaulting World Cup™ will return to Germany from January 31 to February 3 on FEI TV for the next leg of this gripping series in Offenburg.